Borneo beauties, here’s your chance to be a part of the most prestigious beauty pageant in the world as the Miss Universe Malaysia Organization (MUMO) will be holding a closed-door, walk-in audition in Kota Kinabalu, Sabah in search of the new Miss Universe Malaysia 2018 this June. 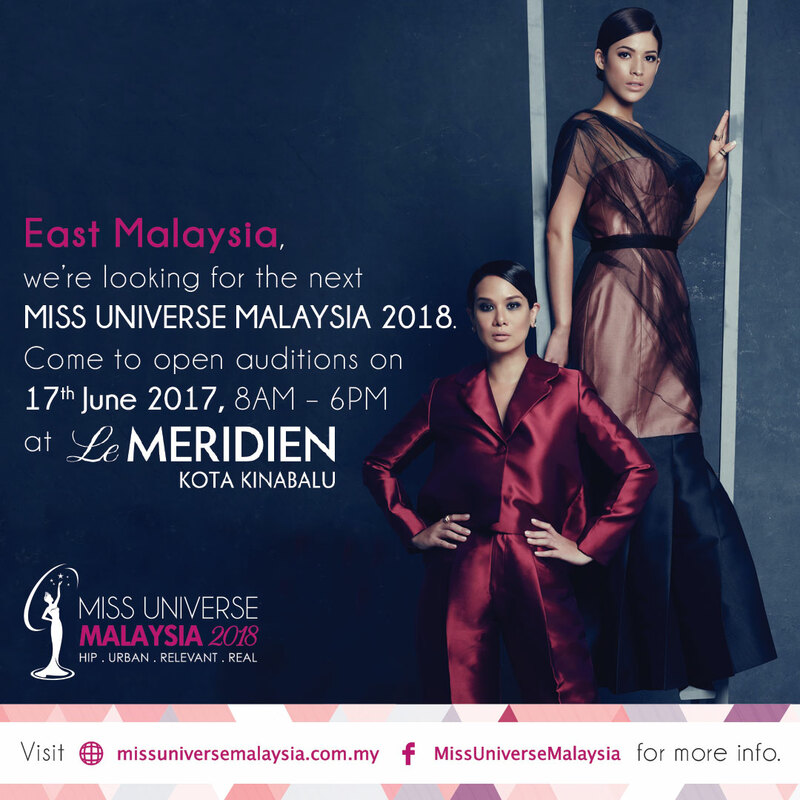 Potential applicants in East Malaysia who think they may have what it takes to be Malaysia’s representative to the Miss Universe pageant are invited to walk-in on Saturday, 17 June 2017 from 8am to 6pm at Le Meridien Kota Kinabalu for an audition with National Director, Datin Elaine Daly. This year, Kupikupifm 96.3 FM, the community-focused radio station will be lending its support to the audition as the Official Radio Partner in Sabah. The walk-in audition is open to non-Muslim, Malaysian female citizens who have never been married, never been divorced, or have never had a child. She must be at least 18 years and under 26 years before 1 January 2018 in the year she wishes to compete, at least 168cm, and able to communicate in any of these languages: English, Bahasa Malaysia, Mandarin or Tamil. Applicants will need to personify all the values and attributes of being a Miss Universe Malaysia, which includes confidence, strong work ethics, commitment, professionalism, talent, grace and beauty. They must also appear well-groomed with make-up and high heels, and bring along their original MyKad and a photocopy, along with three photos showing their face, a full- length shot and a mid-length shot. 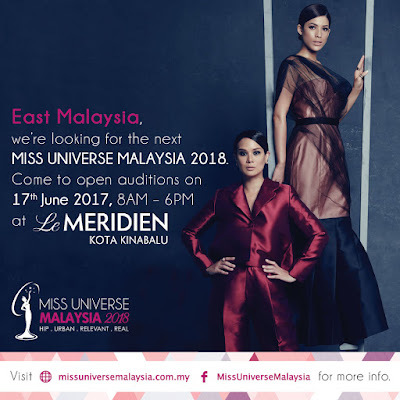 For those residing in Peninsular Malaysia who are interested to try out, they can visit the Miss Universe Malaysia roadshow taking place at Level 4, Pavilion Elite Kuala Lumpur on Saturday, 8 July from 10am to 9pm to register their interest in joining the competition. At the roadshow, past and present beauty queens and finalists, including the current Miss Universe Malaysia 2017 Samantha Katie James will be on hand to meet fans. There will also be a questions and answers session with goodies to be won. Datin Elaine Daly will also be sharing her personal experience as a former Miss Universe finalist, and some insights on what to expect in being a contestant at the Miss Universe Malaysia pageant. 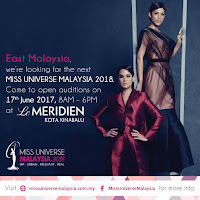 For applicants who are not able to attend either events, fear not, as they can also register online at www.missuniversemalaysia.com.my/registration to enter the competition, and follow the Miss Universe Malaysia Organization’s social media platforms for the latest updates. The Miss Universe Malaysia title holder can expect a life-changing experience once she wears the crown. As Miss Universe Malaysia, she will carry the title wherever she goes, and automatically become a public figure. She will have a platform to brand herself and carry out what she is passionate about. In addition, she will also have opportunities to network with prominent, influential figures all over the world and work with leading industry players, and at the same time, be challenged emotionally, mentally and physically. More importantly, the crowned winner will have an opportunity of a lifetime to travel abroad and represent Malaysia at the Miss Universe pageant to be held in 2018. Additionally, she will also receive a cash prize of RM50,000 and sponsored prizes worth over RM150,000. Qualified young women who are up for the challenge are invited to attend the walk-in audition or roadshow for a chance in winning the most prestigious title in the pageant world. For any enquiries regarding the competition guidelines, please email contact@mumo.com.my. The Miss Universe Malaysia Organization (MUMO) is the country’s premier pageant and reality TV event conducted annually. Conceived in 1962 and revamped in 2010, it is conceptualized to provide a platform for young, ambitious Malaysian women to represent their nation on the international stage, which is Miss Universe. Registered under BEYOND ENTITY Sdn. Bhd. [808537-D], MUMO is the local representative appointed by Miss Universe L.P., LLLP [A WME | IMG ownership]. WME | IMG is the global leader in entertainment, sports, events, media and fashion. Operating in more than 30 countries, the company specializes in talent representation and management; sports training; league development; and marketing, media and licensing for brands, sports organizations and collegiate institutions.